July 8, 2011 — Since October of 2010, Auburn University and in particular the school’s football program has endured a relentless and unprecedented assault on its character and integrity. While some would claim the series of attacks on the Tiger program is typical for programs at the top of the football world, the level of scrutiny to which Auburn has been subjected is without parallel. None of the previous national title holders were similarly probed. Despite the drumbeat from tinfoil-hat wearing message board lurkers and delusionally obsessed rival fans, the so-called smoke coming from Auburn’s Plains has turned out to be a mirage. While scandals sprouted and bloomed at North Carolina, Ohio State and now Oregon (among others) all remains quiet on the Auburn front. Tiger head coach Gene Chizik expressed confidence things would remain so in a series of national interviews to promote his new book, All In. 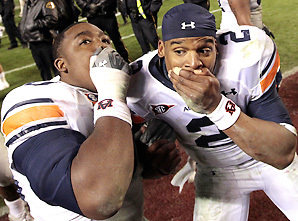 The history of lies spread against Auburn since October is egregious. While most of the lies, rumor and innuendo relate to recent events, Auburn fans have also been disheartened to see decades-old bogus stereotypes resurrected by fans and ill-informed media members. It’s the message, not the messenger we intend to illuminate, but occasionally the two are inseparable. We begin the series with the last item on the list, inspired by a recent column from ESPN senior national columnist Gene Wojciechowski. Auburn would never admit it, but it always wanted to be Alabama when it grew up. Or if not be Bama, at least beat Bama. It got its wish — and a national title — last season, but did so with a one-and-done player (Cam Newton) whose reasons for leaving the University of Florida were never fully disclosed and whose actual knowledge of his father’s pay-for-play attempt remains a mystery today. What Cam may or may not have have known is utterly irrelevant, and his reasons for leaving Florida were well documented, but those are topics for upcoming segments in this series. Be Bama? No thank you. Beat Bama? Been doing it regularly since the first Commodore 64 was released in 1982. Perhaps Wojciechowski elected to pretend the last 30 years didn’t exist, but Auburn “got its wish” in 1982, breaking a nine-win Alabama series streak. Alabama coach Paul Bryant’s dominance in the rivalry cannot be overlooked or excluded. It was a great era for the Tide, one which included multiple championships, both SEC and national. But that era is over. Three decades over. Auburn broke the Bryant stranglehold in his final season, 1982. Since Bryant retired, Auburn has gotten Wojciechowski’s imaginary wish more often than not, including getting that wish in eight of the last eleven seasons. Beating Alabama ceased being Auburn’s goal when Bo went over the top on November 27, 1982. While important from a rivalry standpoint, obviously, Auburn’s ambitions over the past three decades are much higher than just beating the Tide. A win over Alabama is just one step on a path that leads to division, league and national titles. For some, like Wojciechowski, that simple fact has yet to register. So why the vitriol toward Auburn? One of the reasons Auburn has been subjected to an inordinate amount of scrutiny in 2010 is the Tigers upset the traditional applecart. The media is lazy. Media members prefer things to stay the way they were (or they remember them to be). When a team like Auburn surges past the programs they identify as iconic — USC, Notre Dame, Oklahoma, Ohio State, Nebraska or Alabama for instance — the staid media becomes uncomfortable. It’s easier for columnists like Wojciechowski to yammer about traditional powers than it is to accept and recognize that the landscape has changed. Part of his rant against Oregon is based on his perception that the Ducks sacrificed integrity to achieve success. “Oregon got what it wanted (a place at the championship table). But was what they wanted worth it?” Wojciechowski writes. Does Wojciechowski forget that many of the so-called traditional powers have their own notorious skeletons? Oklahoma was ravaged by probation at the height of its 1980s glory. USC and Ohio State are each currently embroiled in scandals. Alabama is the most penalized program in the nation over the last twenty years. The media resists change. It’s why you’ll hear the talking heads ramp up the “it’s a down year in college football” babble any season one of their pre-ordained programs doesn’t sit at the top of the heap. But are those traditional powers based on reality or hazy memory of days gone by? Is it really a “down year” when Oklahoma or USC or Texas isn’t contending for a title? Since Wojciechowski decided to rehash the “little brother” fallacy, how does Auburn compare to perceived national power Alabama? Over the last 30 years, Auburn owns a statistical advantage in virtually every category over rival and supposed traditional power Alabama. The Tigers top the Tide in total wins, SEC wins, head-to-head wins, bowl wins and SEC titles, undefeated seasons and Heisman Trophy winners. Since the retirement of Bear Bryant, without question one of the most dominant coaches in college football history, the norm is for Auburn to be on top. The championship season of 2010 was not an anomaly, it was the return to form of a team that has now gone undefeated twice in the same decade. The last SEC program to field two undefeated football teams in a ten-year span? Alabama. 1961 and 1966. That’s also the last time an SEC program has had two undefeated teams within six years of each other. The Alabama teams of the 1960s are considered part of that halcyon dynasty, one of the crown jewels of the Tide legacy. When you’re looking at ultimate results, what better benchmark than wins? What higher standard than an undefeated season? Teams can’t control the whims and vagaries of human polls, nor can they control what the computers determine. All a team can do is handle what’s in front of it week by week. By that standard, Auburn is among the elite. Since 1980, Alabama posted undefeated seasons in 1992 and 2009. Tennessee went unbeaten in 1998. Georgia in 1980. Those are the only teams other than Auburn to navigate a season without a blemish. Auburn registered three unbeaten seasons, 1993, 2004 and 2010 in that span. Since 1950, Auburn has more undefeated seasons than the majority of the nation’s so-called traditional powers. three schools Alabama, Penn State and Oklahoma (five each) have more than Auburn’s four. Nebraska and Auburn boast four each. The rest of the so-called big boys like USC, Notre Dame, Michigan and Ohio State all fall well short of the Tigers. Despite the perception, despite the constant ringing of the “in Alabama’s shadow” and “little brother” bells by a grasping, gasping media, Auburn is — and has been for the majority of Wojciechowski’s life (and yours) — at worst on equal footing with the elite not just in the state, but in the SEC and in the nation. Some aren’t prepared to and simply won’t accept what’s been staring them in the face since cars came factory equipped with 8-track players. Auburn is and has long been a national football power. Auburn doesn’t live in anyone’s shadow. The Power of Dixieland casts it own. In the next article in this series, the Never to Yield Foundation will examine the realities of the Cam Newton saga and defuse some of the bizarre conspiracy theories. In Gene Wojo’s defense, he is a bald-headed douchebag after all. The truth will set you free. This needs to be sent to all the talking heads. Love it – fabulous article! I can’t wait to read the next one. WDE! Well done and well said. I for one will say “It’s great to be an Auburn Tiger.” I am so proud of AU and the job they did this past season. The bottom line is, Bama thought they would be back on top with back to back National Championships and well that didn’t happen. Heading to P’cola in the morning to see Coach at Barnes and Noble. WAR DAMN EAGLE!!! to all of the Auburn Family out there. Is this website dedicated to promote a positive image for Auburn University? If so, I’ve been looking for something like this for a long time. Thank G-d. It’s ridiculous you can’t even hardly read SI, ESPN, Yahoo Sports etc. anymore cause all they want to do is accuse without any FACTS. Then you got morons like Finebaum. Journalism is dead in this country. Glad there is a site like this who puts them in their places. Tired of them trying put a bad spotlight on our program. All we do is WIN,WIN,WIN,WIN,WIN!!!! WAR DAMN EAGLE!!!! Love it when Bammers ignore the truth. These numbers get brough up every year and bammers cry every year about it. They always point to the margin of victory as their defense. I could care less if we win by fifty or by one, a win is a win. And for the bammers out there, last years Iron Bowl was one of the greatest collapses of all time, with every thing on the line and the chance to ruin Auburn you folded like a deck of cards.